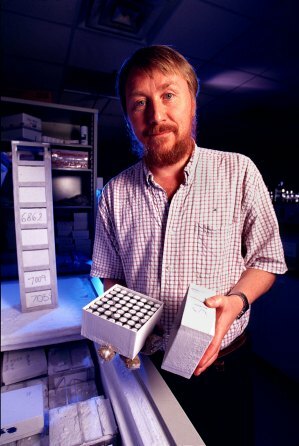 Richard E. Lenski is an American evolutionary biologist, best known for his 25-year long-term E. coli evolution experiment and his work with digital organisms using Avida. What is impressive about Dr. Lenski is that he is trying to show how random mutations and natural selection (the Darwinian mechanism for evolution) can create functionally complex systems within living things. He argues that very small gradual changes can add up over time to produce very dramatic functional changes, exactly as Darwin predicted. Of course, those who favor the concept of intelligent design or the Biblical concept of Creation have long argued that “micro-evolution” is possible, but “macro-evolution” is not. In other words, small changes cannot add up over time to produce highly complex biological systems. In fact, the demonstration of macro-evolution is claimed to be equivalent to finding the mythical unicorn. So, who is right? Has Dr. Lenski really found the elusive “unicorn”? Has he actually shown how macro-evolution via the Darwinian mechanism is really a plausible theory? Well, in 2012 Dr. Lenski and a few others published a very interesting paper claiming to have demonstrated this very thing (Link, Link). He produced E. coli bacteria that, after ~31,000 generations, evolved the ability to use citrate for energy under oxygenated conditions – something they weren’t able to do before. And, they achieved this novel function via random mutations and natural selection – right in line with predictions for the Darwinian mechanism. Finally, those pesky creationists and IDist have been put in their place once and for all! As is generally the case, especially for claims regarding the creative abilities of the Darwinian mechanism, the devil is in the details. And, when one looks a bit more closely at the details of the Lenski experiment, it loses quite a bit of its luster. What Dr. Lenski did was to grow E. coli under oxic (oxygenated) conditions in citrate-rich media. E. coli bacteria are generally unable to use citrate under oxic conditions as a source of energy. However, they can use it under anoxic conditions. In other words, they already have the gene for citrase in their genome. It is just that it is normally turned off under oxic conditions. How is it turned off? Well, the promoter for the gene that transports citrate into the bacterium (citT) is not active under oxic conditions. So, all that needs to happen is to move the citrate transport gene close to a promoter that is actually active under oxic conditions. Once this is done, citrate will enter the bacterium and be used for energy. And, this is exactly what happened. Nothing structurally new needed to be evolved. 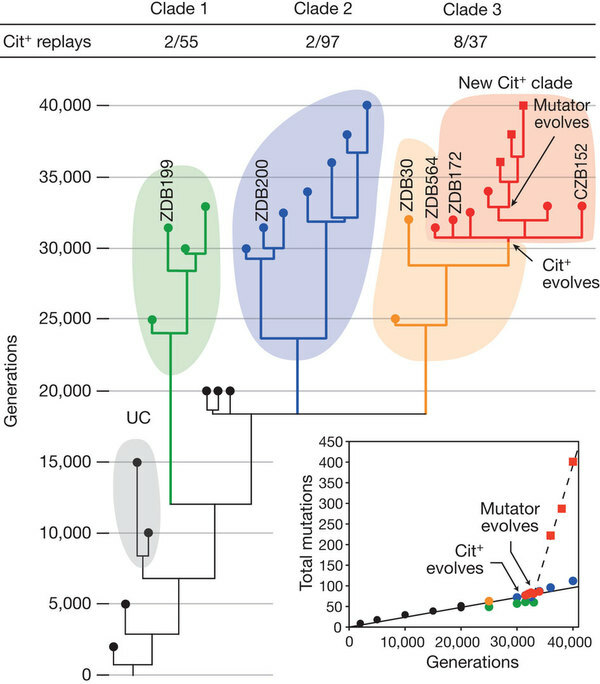 After about 31,000 generations, in a large population of bacteria, there was a single genetic mutation in a bacterium that ended up moving the citT gene and placing it under the control of a promoter (rnk) that is active under oxic conditions. The fact that just this single translocation mutation took so long to achieve should clue everyone in to how difficult it is to achieve even such low-level changes in function via random mutations. The protein product, however, remained the same – i.e., <500aa with no required amino acid changes to achieve a selectable effect. All that was required was to move a pre-existing gene close to a promoter to turn it on during oxic conditions. That’s it. The protein itself didn’t need to be changed for a useful advantage. Now, at this point, multiple copies of the gene were rapidly produced in some colonies. However, having just one copy was enough to produce a selectable growth/survival advantage in the citrate-rich environment. It doesn’t matter if there are 1 – 9 copies of the gene – the same function is realized to different levels – i.e., the cit+ function can exist, to a selectable degree, with just one copy of the gene producing the very same protein. Additional “refinements” are easy once at least a minimum useful level of a particular type of function is realized – not a problem at all. Again, Dr. Lenski’s pet “unicorn” is a very low-level example of evolution in action where nothing structurally new was produced to achieve the function in question. The only thing that happened was a mutational move of a pre-existing gene from one location to another within the genome so that it could be turned on in a particular environment. That’s not a problem at all for the Darwinian mechanism. Statistically, such a mutation is very likely to happen, within a few tens of thousands of generations, given a fairly large colony of bacteria. Now, compare this with the challenge of explaining how random mutations can search through the vastness of protein sequence space (a space comprised of all possible sequences of a particular length) to find the extremely rare islands of novel beneficial sequences that could produce something qualitatively new – an entirely new type of function that requires an new protein-based system (i.e., a new physical structure). Such unicorns are much harder to find because random mutations have to search through vast oceans of non-beneficial sequences before they can find the very rare isolated islands of beneficial sequences. The question is, are there any examples of this sort of evolution actually happening? Well, yes, there are many examples were truly novel protein sequences with selectably beneficial functionality are discovered by random mutations. Most of these examples are single-protein enzymes and the like that require a minimum of no more than a few hundred specifically arranged amino acid residues (amino acids are the building blocks of proteins, with a total of 20 different amino acid “characters” within the “alphabet” of proteins). However, there are no examples of evolution in action producing any protein-based system that requires a minimum of more than 1000 specifically arranged amino acid residues – not even close. The reason for this is because sequence space at this level is unimaginably enormous (i.e., 20^1000 = 1e1301 sequences). To get an idea as to how large this number is, consider that the total number of atoms in the visible universe is about 1e80 atoms. What is more important, however, is that the ratio of potentially beneficial vs. non-beneficial sequences in the 1e1301 sequence space is incredibly tiny – so miniscule that any cluster of beneficial sequences in the enormity of sequence space is surrounded, on all sides, by an enormous ocean of non-beneficial sequences that is so vast that if the beneficial islands of sequences were like stars in the sky no other stars would be visible in the universe from the perspective of one of these islands. That means that getting from one of these islands to the next closest beneficial island, by random mutations, would take trillions upon trillions of years of time. 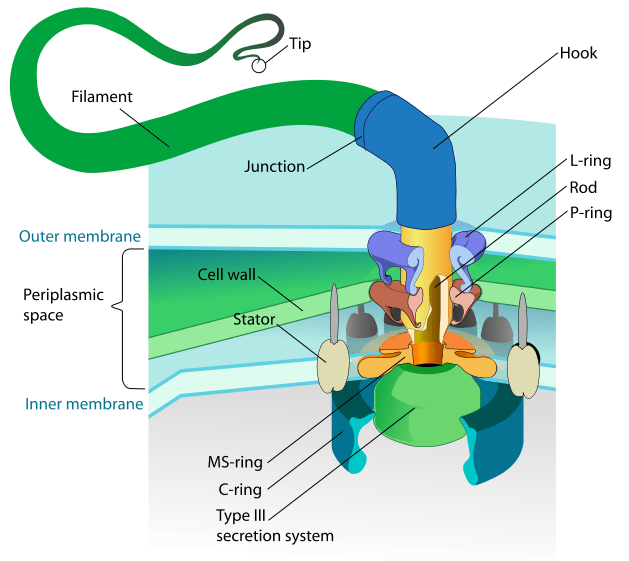 As a real life example, consider that the famous rotary flagellar motility system that exists within various types of bacteria requires a minimum of over 5000 specifically arranged amino acid residues. No such system has ever been shown to evolve nor has anyone presented any statistically tenable argument for how random mutations and natural selection could gradually build such a system. 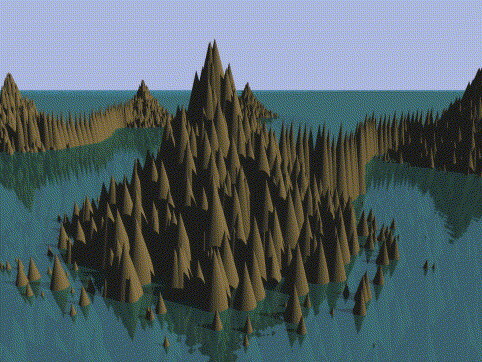 The problem is that the proposed beneficial steppingstones in a pathway of a complex multi-protein system, like a flagellar motility system, are themselves far far too widely separated in protein sequence space, by distances that would cover many universes, for random mutations to get across any of the non-beneficial gaps this side of trillions of years of time. That is why evolutionary progress stalls out, in an exponential manner, with each step up the ladder of functional complexity (i.e., minimum size and/or specificity requirements for a system to work to a selectable level of usefulness). For further information on the statistical limits to the Darwinian mechanism see the “Steppingstone Problem“. This is precisely the kind of information that one needs to evaluate scientific lab experiments. It is impressive to read reports, even in reputable science journals, that describe and often interpret experiments in a way which almost invariably reflects the bias of the reporter. However someone knowledgeable in the discipline is always needed to take a closer look at the issues, as has happened in this case. This is the kind of “peer review” that serves truth. Thank you for respecting the reader’s intelligence! Sean, you really ought to try to publish this material in a mainstream scientific journal or at least in a creationist journal like “Origins.” Simply posting it on an obscure site like “Educate Truth” that few people read is not enough. Just a friendly suggestion! Most of this information, in this particular article, has already been published by others in various journals. The only thing I contributed here of any uniqueness is the concept of changes in the ratio of beneficial vs. non-beneficial sequences in sequence space at various levels of functional complexity. When I submitted the technical argument for sequence space to Origins (a few years ago), they told me that it was too technical for their readership to understand. I should probably try again to submit a toned down version for more general readership. I’ve published in Hormones and Behavior, Neuroendocrinology Letters, Journal of Psychology and Human Sexuality, and twice in Socioaffective Neuroscience & Psychology. No matter how clear it becomes that mutation-driven adaptive evolution is not possible due to biophysical constraints, each time random mutations are introduced into any explanation helps the nonsense about mutation-driven evolution to spread. As a Creationist, Dobzhansky supported mutation-driven evolution in 1973 and attributed single amino acid substitutions to mutations. They are obviously nutrient-dependent and facilitate rapid changes in organismal complexity in 5-10,000 years, not millions of years, as evidenced in the current literature. The changes are clearly constrained by thermodynamically futile cycles that enable de novo creation of olfactory receptor genes, which allow nutrient uptake (as in the case of citrate in E.coli) and nutrients are metabolized to pheromones that help to achieve the organism-level thermoregulation that is required for species-wide epistasis. If the epigenetic landscape changes, however, a novel nutrient can initiate the same process of nutrient-dependent pheromone-controlled adaptations (e.g., in species from microbes to man). Lenski has simply showed that nutrient stress and thermal stress have the same effects on seemingly futile cycles of protein biogenesis and degradation. It doesn’t matter what stressors may or may not contribute to protein biogenesis. The fact remains that whatever else might contribute to mutagenesis, novel proteins are dependent upon novel genetic mutations. In this particular Lenski experiment, no novel protein was produced. 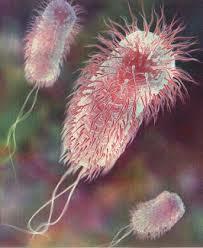 However, there was a novel genetic mutation that gave rise to the new functional abilities of the E. coli bacteria. This genetic mutation simply allowed a protein-coding gene to be turned on in a different type of environment by moving a gene to a different location within the genome. Statistically, this isn’t a problem given the number of bacteria in the steady-state population over the course of a few tens of thousands of generations. It’s very predictable in fact – statistically. What is not statistically tenable, however, is the evolution of a qualitatively novel protein-based system of function that requires more than 1000 specifically arranged residues. Such a feat is not statistically feasible – and Lenski should know better than to suggest otherwise. Perhaps I’m mistaken, but I don’t know of any other way for citrate uptake to occur if it is not receptor-mediated. Should I refer to the de novo creation of the olfactory receptor gene, as de novo creation of a chemical receptor gene? There was no change in the citrate receptor or transport protein, or any other protein. No structural change took place at all. You simply don’t understand the Lenski experiment. All that happened was that the gene that codes for the citrate transport protein, which already existed and was active under anoxic conditions, was turned on in an oxygenated environment by being placed next to an active promotor. That’s it. There’s simply no new receptor being made here. No new gene or protein – olfactory or otherwise. novel proteins are dependent upon novel genetic mutations. The ability of mutations to cause production of functional novel proteins is biophysically constrained. Mutations perturb the required thermodynamics and organism-level thermoregulation. Nutrient uptake enables seemingly futile cycles of protein biogenesis to result in production of proteins that contribute to increasing organismal complexity via controlled reproduction. I am surprised that you immediately turned back to mutations theory, when the de novo creation of olfactory receptor genes excludes mutations theory from any further consideration whatsoever. The adaptations arose [in the Lenski experiment] due to the de novo creation of olfactory receptor genes under conditions that would otherswise lead to death by starvation. This simply isn’t true. No new receptor genes evolved at all – olfactory or otherwise. The very same genes stayed exactly the same. The only thing that changed is the location of the very same genes within the genome. Also, the bacteria were not starving. They simply started using citrate as an additional source of energy to the nutrients that they were already being provided with – over the course of the decades that Lenski has been running this particular experiment. I see no evidence for epigenetic factors in play here or thermodynamic instability before or after the changes in function.